Wherever you live, whenever you need a break from work, city life, or the crowded modern world, camping is a great escape! We have camped many times, especially near the Blue Ridge Parkway in the Appalachian mountains. On different occasions, we have gone both prepared and unprepared, and we can tell you that having some cool camping gear leads to a much more relaxing experience! Maybe you’re not a camper yourself, but you’re looking for some terrific camping gift ideas. 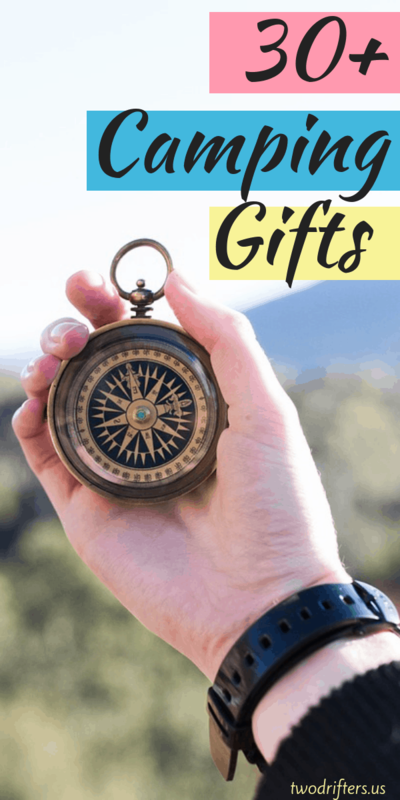 The range of gifts that you can give to the camper in your life is wide, and you can be assured that they will be put to good use. 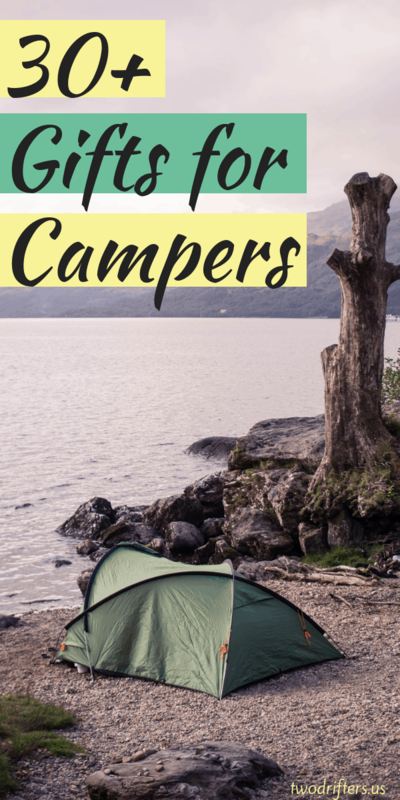 Depending on an individual camper’s desires, they can keep their trip simple or go all-out with all the handy gifts for camping lovers that they can imagine! Here, we have assembled a partial list of the best camping gifts for outdoor lovers. No matter your budget or the needs of your favorite camper, you can find something that will help make their outdoor dreams come true! The right tent makes a great camping gift for dad, for your sister, for your cousin, or for yourself! Let’s start with the most basic and obvious camping presents in any camper’s arsenal: a good tent! The possibilities here are endless and depend on an individual’s needs. The solo camper will likely want a tent sized just for them. With its easy two-pole setup and extra pockets for storage, this ALPS Mountaineering tent is just the thing. 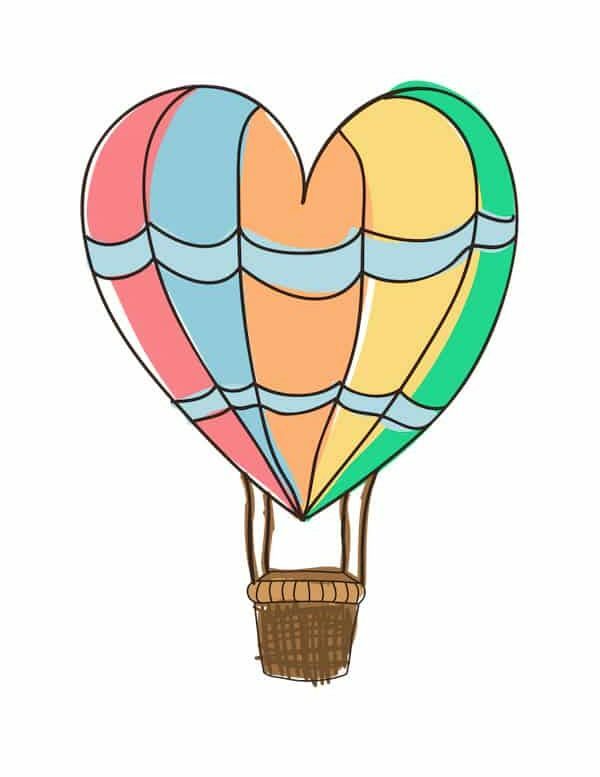 Those looking to bring an element of romance to their camping trip, however, may wish to bring along a significant other. To make room for two, consider this Coleman two-person tent. With its easy pop-up setup, you will be snuggling with your sweetheart in no time. This comfort starts on the foundation of a good portable mattress. These range from the simplicity and light weight of the VENTURE 4TH ultralight sleeping pad to the larger IFORREST sleeping pad, which comes equipped with a built-in pillow. Either one will give the camper a base of support and comfort to help them rest easy on their trip! The next step on the camper’s journey to comfort and a fun trip is their sleeping bag. The varieties that these come in are nearly endless, but one must consider what climate one is likely to be sleeping in. The Coleman Sunridge is suitable for moderate temperatures while the Coleman 0°F Mummy is, as its name indicates, built for colder temperatures and zips up to cover nearly all of the camper except for their face. Whatever you choose, your camping lover is sure to appreciate the extra cover and warmth! The final piece of your beloved camper’s sleeping arrangements is their pillow! Depending on the other sleeping equipment that you have already purchased, the pillow may already have been provided, but it is likely that you will still need to chose one. The Therm-a-Rest Compressible travel pillow and the Wise Owl Outfitters camping pillow are both compressible and foam-filled for convenience and comfort. Sweet dreams campers! Speaking of sweet dreams, another place to relax and sleep, hang out, read, do whatever you want is a good hammock. Some of these are attached to trees in the vicinity of a campsite, such as the Wise Owls Outfitters Hammock with Tree Straps. Others, like the AmazonBasics Fabric Hammock with Stand, are freestanding and can be set up wherever there’s room. Whatever your choice, you will be giving the camper in your life the gift of rest and relaxation. When spending time outdoors, there are a number of options for keeping oneself away from unwanted insect encounters. One useful choice, especially when sleeping outside, is a mosquito net. These often come in the form of large structures, such as the EVEN Naturals mosquito net, which cover a wide area. Others, however, often more personal protection. These include the EVEN Naturals mosquito head net, which fits under one’s collar to protect their face and neck. The other major category of mosquito protection is repellent. The camper’s options for this are wide-ranging. Some of the simplest options aim to clear out all the mosquitoes from a given area (e.g., around one’s tent). One example of this is the Flowtron BK-15D Electronic Insect Killer, a lantern that purports to be effective over half an acre. Since they, too, spend time outside, this lantern has to be one of the coolest gifts for RV owners that I can think of. alk about handy gifts for RV campers and everyone else! Once your favorite camper has taken care of their shelter and the insect menace, they must consider the next camping essential: the fire! While those of us who learned to start fires as kids are admirable, the easy and short route to a roaring blaze is a fire-starter log. These ignite and burn easily, giving the camper time to add more wood and build a fire around them. One popular option is Duraflame 4577 Ultra-Premium Firelogs. For a fun and interesting experience, among the most unique camping gifts that I have seen are Evergreen Research Magical Flames. Tossing these pouches into the fire will produce a rainbow of colorful flames that can last for over an hour! A nice way to spice up the night. Wood isn’t all that’s needed for a good fire. Unless a camper has some real bushwhacking skills, they will also need a lighter. One solid choice that will keep your fingers well clear of the flames is the Sparcker Electric Arc Plasma Lighter. For those of an old-fashioned bent, consider the überleben Zünden Fire Starter, which offers the primitive, satisfying strike of metal on metal, throwing sparks to start a fire. One they have their shelter set up and a fire roaring, the next thing your camper will want is to fix up some food. There are many different options for camping stoves out there. Some, like the Solo Stove Campfire, are compact and run only on wood. Others, like the Camp Chef modular cooking stove, run on propane or natural gas. Just be sure your loved one brings the right fuel on their trip! The latter stove can be rearranged to fit grills, griddles, or even ovens. Being in the wilderness, an important consideration is what to do with all the leftover and uneaten food. To avoid attracting bears or other large predators, campers frequently hang their food in bags from trees, out of reach from the ground. Here, as in all areas of camping, multiple options are available. The GONDAR Large Smell Proof Bag purports to offer an airtight means of storing food to keep bears from smelling it. Though the BearVault Bear Resistant Food Canister performs the same purpose, its solid structure and multiple sizes allow campers versatility in how much food they store or carry. Now that the fire is set and storage means are at hand, it’s time to talk snacks! Rarely are the treats taken on a camping trip particularly healthy, though we have included an option or two here for the strongly health conscious. Let’s start there. First up are Trail Truffles. Billed as “paleo plant based vegan energy bite balls,” these offer campers and hikers a chance to snack while staying fit. The same goes for NOKA Superfood Pouches, which focus on fruit flavors packed into little, sippable bags of goodness. For longer trips or those including more people, consider a box of Healthy Snack Bars To Go. This package includes brands like Clif, Kind, Kashi, and more in a smorgasbord of snacky delights! Now down to the sugary stuff. Fyre S’mores offer ready-to-eat s’mores for those who don’t feel like assembling their own. For those who enjoy toasting marshmallows and putting together their snacks, Hershey’s S’mores Caddy offers a convenient transport and storage container for all the necessary s’more components. If your camper does not have the time or equipment to get a fire going, the Nostalgia Electric S’mores Maker acts as a little fireplace over which to toast your marshmallows. Finally, MalloMe Marshmallow Roasting S’mores Sticks let you heat your chosen treat–whether it’s marshmallows or hot dogs–on their sharp narrow tips, with a handle meant to keep your hands clear of the fire. What about a sweet hot chocolate to warm up your night? Mixes for hot chocolate abound, from the perennial favorite Swiss Miss to the always-popular Ghirardelli. Whichever you choose, your loved one will drink to their luck at having you in their life! Now that the snacks are sorted, your camper will want someplace to keep cool any food or beverages he or she brings along. The Igloo Quart Cooler is a solid, classic type while the CleverMade SnapBasket is soft and bendable. Either may work, depending on your camper’s storage needs. We could go on and on with ideas for cool camping gifts, but this seems like enough to get you started. What items did we forget about? Let us know in the comments!